EDIDowner advise the bikeway along the freeway between Zig Zag Rd and Mundijong Rd will be closed for repairs from 7 am – 5 pm starting 5 June. Bikes will be detoured along Baldivis Rd. The works are expected to take 10 days. 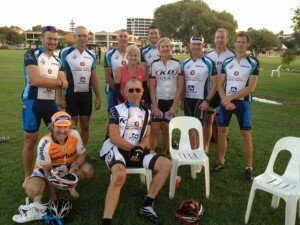 Expressions of interest have already been received for next year’s Five Dams ride. The ride will be on 14 April 2013. If you are interested in participating in this event and/or the preparatory training rides, please contact Peter Mills on 0418 910030 or watersedgepark@gmail.com. BWA advise that the event scheduled for 29th April as been cancelled. Details available from www.bwa.org.au. Issue 125 February 2012 of the club newsletter is available for download here. Welcome to the new Peel District Cycling Club website!